If this is one of your first foray into the complex and often daunting world of applying for a mortgage, you probably have a list of questions lined up, including “what is a Good Faith Estimate?” Also known as a GFE in short, a Good Faith Estimate is essentially a form that lists all the basic info regarding the terms of a home loan that you’ve applied for. As its name suggests, it provides a total estimate of the costs you should expect from the loan in question. It’s very useful to be aware of these costs, since they’ll be of great help during the mortgage application process. When you’re aware of all the expenses involved, you can compare several offers on the market more accurately, get a better grasp of the actual costs the loan will entail and, all in all, help you make a better educated choice of home loan. When should I expect to receive the Good Faith Estimate form? According to current standards enforced by the Consumer Financial Protection Bureau, all mortgage applicants are supposed to receive the GFE from their lender or mortgage broker of choice within three days of submitting their loan application. Similarly, if you’ve made a written request for any other mortgage-related information, they need to respond with a GFE within the same span of time. The lender or broker cannot charge you any fees until they send you the form and you formally indicate that you are going to pursue the home loan in question. The only expenses you can incur before then are credit score costs. On the other hand, within those same three business days stipulated above, the lender could decide to turn down your application. That gives them 30 business days to provide you with written information as to why they turned you down. Alternatively, you have 60 days to formally demand they tell you why your application was denied. Remember that receiving a GFE is in no way legally binding, as to where the approval of the mortgage is concerned. It neither means that you have to apply for that specific mortgage, nor that the lender is thereby committing to approve your potential loan application. What happens if I never receive my GFE? If three business days have passed since you filed your complete loan application and it was received by the lender/mortgage broker and you still haven’t received the form, you need to get in touch with them. Find out if your application was denied during those three days; if it wasn’t, they are required to send you the GFE. Should they refuse to comply, you can file a complaint via the CFPB Complaints Portal or call their direct number (1-855-411-CFPB). Since 2010, the HUD-1 Settlement Statement has come to include the Good Faith Estimate, too. 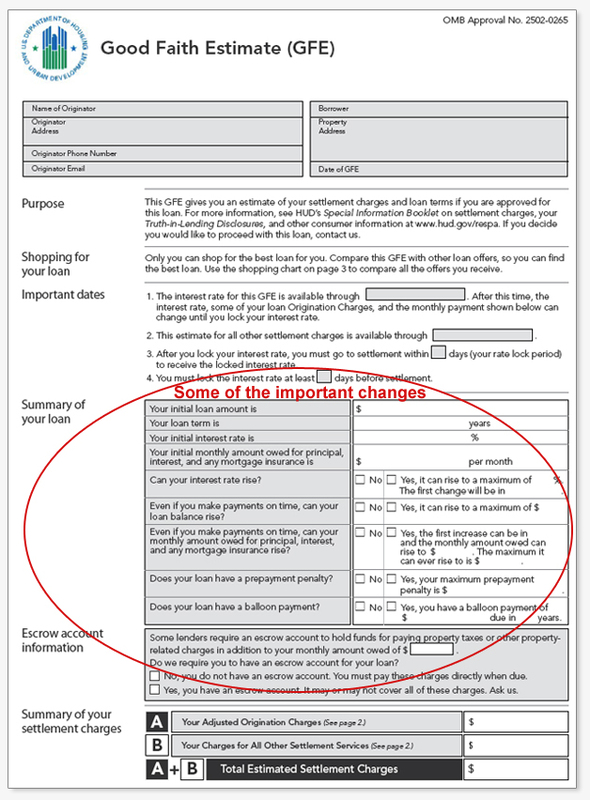 This form includes an itemized list of settlement charges: services and fees whose costs will be charged to the borrower by the lender or broker during the mortgage application process. The HUD-1 is made available to the prospective borrower one day before the settlement. It’s filled in by the settlement agent in charge of the settlement in question. In addition to the HUD-1, the GFE also includes estimated settlement costs from the lender. Should you discover any differences or changes, when comparing the HUD-1 with the GFE, make sure to ask your lender or mortgage broker about them.